For the next few months, the farm is fostering Seymour the cow on behalf of the Ahimsa Milk Foundation – a not-for-profit dairy company that produces slaughter-free organic milk. Inspired by the Hare Krishna-run Bhaktivedanta Manor, Ahimsa is researching innovative and sustainable farming methods using oxen, including a pension scheme and hospice for non-productive cows and bulls. For a little insight into the farming at Bhaktivedanta Manor, watch Donna Lipowitz’s short documentary film Gokula – A Place of Earth for Cows (2011). It is a daunting business getting in close proximity to a juvenile bull who is still adjusting to new people and surroundings. I sat with Seymour in his cow shelter, stroking his nose and photographing different parts of his body. He was restless with the heat and flies incessantly buzzing round his face. Last Tuesday I recorded him mooing. As I stood by the gate, he licked my knee, his tongue large and rough. The process of taking the photographs reminded me of the beautifully stark, fragmented self-portraits of John Coplans that I first saw at the Dean Gallery in Edinburgh when I was 17. I remember how exciting I found them – the forensic examination of his ageing, hairy, male body, its otherness glorified in large black and white prints covering the walls. I still have a certain fondness for those images, and the exhibition catalogue sits on the shelf above my desk. Then there is Helen Sear’s photo series Grounded (2000), where the furry backs of animals become vast landscapes against the backdrop of her skies. I remember her showing them to us in an artist lecture on the first year of my photography degree when I was 19. I remember the pearl necklace she was wearing. I remember the summer in France when cows were calfing in the forest surrounding our house. There was a particularly inquisitive ginger one, whose attempts at affection were hindered by her large horns. I remember how it felt to be living a wild life amongst boar, bear, vultures, vipers, deer and dormice. That feeling came back to me as I stood surrounded by large scale pencil drawings and oil paintings of animals in Clara Drummond‘s recent exhibition at Flowers Gallery on Cork Street. A strong longing to be immersed in nature. She used to massage slugs and snails. I remember one crawling over her hand, across her palm and up her wrist, tracing its journey with a thin trail of slime. She brought the tentacled beast close to her face, planted a kiss on its large foot and said she loved it. Slugs and snails and puppy dogs tails, that’s what little boys are made of. But the snail is both female and male. Since I have been on the farm, I have been assisting Esther in education, working with local school groups from nursery to secondary level. One of the favoured activities with the younger ones is the minibeast hunt, collecting and identifying invertebrates from the gardens, normally a lot of Helix aspersa garden snails – the same species used in French cooking. These lucky snails are then released, whereas other snails found on the farm are fed to the ducks and chickens. Then we bring out Esther’s pair of Achatina fulica giant African land snails to much excitement. These gastropods can grow up to 20cm and, like other terrestrial snails, are simultaneous hermaphrodites, meaning that they contain both male and female sexual organs. Snails of a similar size carry out bilateral mating, where each snail in the pair is simultaneously fertilised. If the two snails are different sizes, the larger one acts as the female. They breed rapidly, sometimes laying as many as 200 eggs five or six times a year, and are considered one of the world’s 100 worst invasive species. Drawing of the reproductive system of Helix pomata by Johannes Meisenheimer, 1912. Transatlantic Skype chat between my cat Texas and my brother’s dog Java. In March this year, building work began on the new Spiralfields community garden on a plot of land recently handed back to the farm by Network Rail. The permaculture project, designed by Roundfield landscape architects, incorporates a roundwood sheltered walkway and seating area overlooking the city skyline, a large trough for harvesting rainwater from the shelter’s roof, raised vegetable beds, a forest garden with fruit trees and shade plants, nitrogen-rich hedgerows to be used as mulch, and a totem sculpture fixed in a spiral plinth. The low-carbon build is being carried out by Fletcher Worley and his horticultural design and build team at Chauncey Gardens, alongside a team of volunteers from the local community co-ordinated by Richard Walker at the farm. I have been documenting the transformation process since the delivery of the UK-grown cedar logs in April. The project is due to be finished in the Autumn. 1. Delivery of UK-grown cedar trunks. 2. 15 tonnes of green waste compost from the EcoPark Compost Centre in North London. 3. The Osmani Men’s Gardening Group debarking the cedar logs. 4. Digging through layers of old buildings to create holes for the trunks. 5. The decking is made with reused scaffold planks. 6. A plum line to check the logs are straight. 7. The logs are hoisted up using a winch and pulley system. 8. A jig made with scrap wood and old paving stones from the garden. 9. Bean poles at the back of the garden. Concept sketch by Roundfield, looking south east from seating area. Architecture Without Architects by Bernard Rudolfsky, originally published by MOMA New York (1954) to accompany the exhibition of the same name. A wonderful book displaying different examples of vernacular architecture, including dwellings built inside living trees and the labyrinthine entrances to the Inari Shrine in Kyoto made from unsawed trunks. And here is a bean pole structure I proudly built (middle) tied with strips of flax leaf grown on the farm. Thanks to Richard, I recently discovered that there is a type of friendly bacteria in soil that has a serotonin producing effect on the brain. So the ecotherapy results of gardening are that direct. On a similar note, I am excited to visit the new rooftop woodland garden at the Southbank Centre this summer. The project is an extension of the nearby Queen Elizabeth Hall Roof Garden. Created as a partnership between the Southbank Centre and the Eden Project, both gardens have been built and maintained by staff and volunteers from the recovery and wellbeing Grounded Ecotherapy gardening team from Providence Row Housing Association. I realised today that I hadn’t yet posted any sheep sounds. So I wandered over to their paddock, where Teggan was busy scratching her belly on a hay bale, and the other ewes were hanging out in their light summer coats, having been sheared at the annual Sheep & Wool Fayre earlier this month. Gracie the Southdown x Suffolk sheep, who celebrated her 1st birthday in May and was recently seen walking across London Bridge with Stephen Fry. Recording no. 1 is less an example of sheep sounds – they didn’t utter a single bleat while I was there – but more an excerpt of the various ambient noises that the farm sheep hear: ice-cream van, children in the play ground, trains, a power drill, and so on. It begins with Gracie peeing, then there’s an exciting moment 1 minute in, when a bee buzzes around her legs. Recording no. 2 was made in the sheep’s night enclosure, as they were waiting to be fed. The loudest bleats are from the Castlemilk Moorits. Last Tuesday, I milked Bramble the goat. She is still breastfeeding Hazel, her 7 week old kid, but as she is a rare breed Golden Guernsey raised for high milk yield, she produces a surplus. This excess milk needs to be drained daily for her comfort. It is a curious activity. Unpasteurised goat milk has a host of health giving properties. For a start, it’s composition is relatively close to human milk. This in particular interests me. Some years ago, I milked a sheep, spraying the frothy liquid straight into my mouth like a warm milkshake. And now, drinking Bramble’s milk, I am reminded of that moment. I hear the sound of the mechanical milk pump beating out its pulse. But I am older and the hot milk hits me with a pang of emotion; comforting and claustrophobic. Joyful and melancholic. Its richness overwhelms me. The bulk of my research over the past 7 years has been concerned with inter-species dialogues and nurture; there is a lot I can write about milk. For the moment, however, I want to direct my focus to the milk stand. Today, I started researching goat milking stands and found a world of architectural oddities. They make me think of Friedrich Nagler‘s little animal sculptures, made with reclaimed bits of metal, nuts, bolts, old taps, and so on. I imagine a Jan Svankmajer stop-motion animation, where the milking stands come to life, running around the stable, eating hay and bleating. Taken aside and photographed as objects of interest, they take on a gravitas unbelied by their banal utilitarian design. The inanimate object replaces the animal. 1. Taken in the playground at ZSL London Zoo. 2. My childhood miniature rocking horse. Sequins and tights and silk top hats. I’ve always gotten along with cats. I’ve had String Theory‘s version of Lion Tamer stuck in my head for the last few days since re-watching Cat Dancers. I have long harboured dreams of being in the circus. When I was a child we went to Florida and there was a man who had a cat show. It was evening and they would jump through rings of fire. I was impressed. I used to dress my cats up in costumes and push them around in a pram, or photograph them jumping out of top hats and tinsel. They didn’t seem to object. 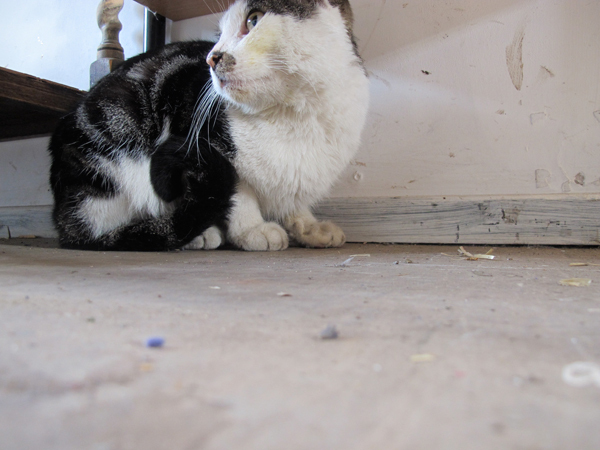 A stray tom cat has been hanging around the farm recently. A dish of food was left as a trap for him in the portacabin where I work, and at the end of the afternoon in he wandered. He grabbed a mouthful of meat and ran away. I went outside. He approached cautiously, a little more each time I turned. A flash of the Stalking Cat. As he entered the room, I closed the door, trapping us together inside. Him wide-eyed and wild, began hurling himself at the windows. Then settled under the table, growling. I gave him his bowl of meat and slowly he let me approach him. And as he finished the food, he had calmed. I stroked and tickled him and he licked and nuzzled me in return. Today, he went to the vet to get castrated and have a blood test. Once the results come through, he will need a new home. In the meantime, I need to think of a name for him.